This month’s spotlight shines on Samia Haroon (@samia_haroon), part of the Clinigence sales and marketing team, and host of this month’s #healthITchicks chat on Wednesday, October 18 at 1pm ET. Samia and her husband – who are just one month shy of their tenth wedding anniversary – recently bought their first home north of Atlanta in Dacula, GA. She moved to the metro Atlanta area from Nashville, after receiving her bachelor’s in statistics and computer information systems. She furthered her education by completing the health IT certification program at Gwinnett Technical College. When it comes to technology, it’s also no surprise that she turns to apps when she wants to take her mind of the busy world of health IT. “I love to shop, so any of my favorite stores’ apps – Macy’s, Sam’s Club, Pinterest, and Amazon – are my personal escape,” she explains. Samia uses Facebook, Skype, LinkedIn, and Twitter personally and professionally. She is also fond of Blue Cross Blue Shield’s personal health record app, which lets her easily stay on top of health-related issues. What’s the biggest leap of faith you’ve taken during your career? How has that impacted where you are now? I came from a retail background and wanted to go into banking then into education, which changed when I got a scholarship from Gwinnett Technical College to pursue a Health IT Certificate program. I had no background at all in healthcare. Coming from Nashville, healthcare has always fascinated me. I used to want to work for HCA and pursue health as a major, but I’ve always been a “numbers” person, so I chose analytics instead. My current job at Clinigence provided me with the training and knowledge of how healthcare organizations are managing better health outcomes, and what it means to both the providers and patients. I understand (or try to) the true value of value-based care. When it comes to professional development, what has had the biggest impact on yours? 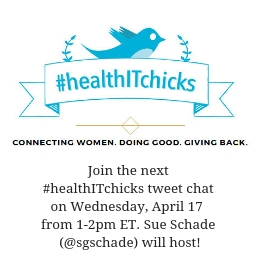 I would say my health IT mentor, Patricia Whitley, and #healthITchicks have been my biggest influencers. When you keep pushing for a bigger role and always chasing something bigger, your potential will be limitless. What advice can you offer younger women looking to break into healthcare technology? For those just starting out, pushing yourself out of your comfort zone will reveal that you have the potential to be great at that task. You are never asked to do something if someone believed you couldn’t do it, so like John Lynn has told me, “Keep Grinding.” Persistence is key to showing how interested you are in the company when you feel like you aren’t given the chance. What gender workplace topics have resonated with you over the last year? One that stands out is a woman’s place in the household. Are we missing out professional opportunities given our busy schedules? What are you looking forward to chatting about during the #healthITchicks tweet chat on October 18? What resources help you compartmentalize stress? What are some best practices you’ve encountered at the doctor’s office, or heard about from other patients? How do you engage with individuals through social media in order to raise awareness? What topics do you gravitate towards? What are your core values and do they align with other organizations you work with? How important is it to the receiving party, especially in the healthcare organization. I’m a big foodie – a few #healthITchicks know me for my cooking. But, I’m also on a diet and so would like to know how chat participants balance exercise, food, and other activities to engage in better health in the workplace. Join me and Samia Haroon (@samia_haroon) for the #healthITchicks tweetchat on Wednesday, October 18 at 1pm ET. You can also connect with us on LinkedIn via the #healthITchicks group.